West Ham: Why has London Stadium move been so problematic? In May 2016, when West Ham were making their final preparations before completing their move to the London Stadium, co-owner David Sullivan addressed the thorny issue of leaving Upton Park. "Yes," he said, it was quite possible, indeed probable that "half of our fans don't want to move". But it would soon become apparent the decision was right, he insisted. Citing modern transport links and better toilet facilities as obvious areas of improvement, Sullivan felt that, while not everything in their new home was perfect, particularly the distance from the main stand to the pitch, it would only take six months for supporters to be shown the wisdom of West Ham's momentous relocation. This was the venue, after all, where Usain Bolt won three Olympic gold medals and Super Saturday became part of British sporting folklore. The transition is taking longer than Sullivan thought. West Ham are almost a season and a half into their settling-in period and it is fair to say no-one is entirely happy. Part way through their debut campaign at the London Stadium, manager Slaven Bilic identified a problem. While the pitch size is a Premier League standard 105m x 68m, Bilic felt the green colour that surrounds it disorientated the players and made them feel the arena was bigger than it actually was. Was it possible to have a different colour, he asked? West Ham were willing to pay the £250,000 estimated cost and they suggested claret, which would at least give the space, which is needed for athletics events but an oddity in a football stadium, a homely look. The answer from the organisation that runs the stadium, E20, came back that it was not possible. West Ham could have navy blue, which was in keeping with the London Olympic venue, but nothing else. They decided to keep things as they were. 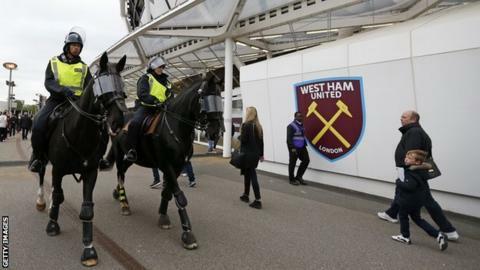 It is just one of the inherent frustrations West Ham, as tenants, have with the stadium. Last summer, after Pablo Zabaleta completed his move from Manchester City, the normal welcoming pictures were done from the London Eye. With the stadium in a state of transition as it was being prepared to host the World Athletics Championships, West Ham decided not to ask if they could hold the photo shoot there as they did not feel comfortable with the likely result. Staff members using West Ham's stadium office could not park in the normal car park and were offered the use of shuttle buses to get them from the alternative parking area. On 1 December, London mayor Sadiq Khan announced he had taken control of the stadium following publication of a review that was hugely critical of previous administrations. The review calculated that the stadium will lose £24m during the 2017-18 season. This deficit is largely due to a business plan that has proved to be wholly inadequate. Turning the stadium into a football venue after the Olympics cost £323m rather than the projected £190m, which the review regarded as "unrealistic". In their own early bid to take over the running of the venue, Tottenham Hotspur said it would cost around £320m to knock the Olympic Stadium down and build a football-specific one on the same site. Changing the seating arrangement for the 2017 World Athletics Championships and putting it back again was £11.8m. The initial budget from March 2013 had been £50,000. In business plans as recent as March 2016, the cost was budgeted at £300,000 even though the tender for the work exceeded £1m. The mayor's office has pledged to speak with West Ham and UK Athletics in a bid to "address flaws in the existing arrangements", reduce their own costs and make the stadium financially viable. On Saturday, West Ham beat London rivals Chelsea 1-0. Along with a similar success against Tottenham in May, it was one of the few high spots since the club moved out of Upton Park. A crowd of 56,953 proved that, contrary to popular belief, the stadium is capable of generating a positive atmosphere. Yet the underlying view remains a negative one. Mark Walker, interim chairman of the West Ham United Independent Supporters' Association, said that rather than getting used to their new surroundings, the opposite is now true. "A lot of the goodwill from before we moved in has been lost," he said. "Fans feel it has not lived up to the expectations or promises that were made. "The transport links are not as good as anticipated. The distance between the pitch and the stands is too big. "The fans who sit at the back of the upper tier of the stand have no toilet. They can't get a cup of tea. "The idea of going into a new stadium was to attract more fans. For that to happen, you need success on the pitch, and results have been woeful. We are still third from bottom even after a tremendous result like beating Chelsea. If we lose to Arsenal on Wednesday and Stoke at the weekend, we could be bottom by Christmas." West Ham reject the assertion there are inadequate toilet and catering facilities at the stadium. A spokesman said: "Every single seat at London Stadium has access to toilet and catering facilities, with 995 toilets and 43 catering outlets, vastly more than the Boleyn Ground." Ken Dyer has been watching West Ham since the 1950s, first as a young boy with his dad, then as a highly-respected journalist for the London Evening Standard. Dyer always felt moving away from such an iconic stadium as Upton Park would be fraught with difficulties, both emotional and physical. However, he does not feel the club had much choice given how top-flight football in England has evolved into far more than a Saturday afternoon out for a local fan. He said: "Upton Park is part of my life. It was a wrench to leave, like leaving a home you have been in for 40 years. "If you wanted an experience that was almost 100% different to Upton Park, this would be it, even though it is only three miles down the road. "But Upton Park wasn't the Upton Park I remember from years ago. It had lost a bit of its atmosphere. Most grounds have over the years. "There are fans, younger ones with families, who find the facilities at the London Stadium are so much better. "Gradually it is starting to feel like home. But sometimes it has been two steps forward and three back. It has taken a long time and they are not there yet." Stuart Pearce returned to West Ham last month as assistant manager, rejoining a club he played for between 1999 and 2001. "It does feel like a different club," he said. "In many ways football clubs don't change their DNA. That comes from the terraces, the fans and the long-serving staff. "Lots of us in football have this rose-tinted vision of what things used to be like. But make no mistake, only a fraction of it was like our memory tells us it was. "West Ham have got a fantastic stadium and I think it's important that we create history in that stadium. There's nothing to be gained for West Ham by saying 'it's not a football stadium'. All that does is benefit the other 19 teams in the Premier League. "What we have to do is say 'this is our home, let's create some fantastic memories'. The two games we've played there since I returned, against Leicester and Chelsea, the crowd have been brilliant." It is impossible to argue West Ham did not negotiate a great deal when they struck an agreement to pay £2.5m for 25 "event days" per year. The stadium loses £2.25m simply by letting them play matches there due to costs such as stewarding, policing, catering and turnstile operation that they are responsible for. It is understood West Ham are not unwilling to increase their overall contribution. However, as with any negotiation, they will only hand over more cash if it results in them getting greater flexibility in their use of the stadium and an ability to manipulate it into a venue that serves their purposes to a far greater degree than it does at the moment. For their part, the mayor's office are not willing to publicly state what may be on the table as a bargaining tool at such an early stage of what are likely to become extensive negotiations. Sorting out the naming rights issue is an imperative, which is obvious from the review, and requires West Ham's involvement if revenues are going to be maximised. And all this against the backdrop of a potential relegation battle that, unless it is won, would be a financial catastrophe and turn the London Stadium into the biggest ground in the second tier since Manchester United were relegated in 1974.